So, regretfully, we took industrial action again; for the third time in two and a half years, but the first time since November 2011. Then, it was against coalition cuts to the public sector, and pensions in particular. This time, it was regional action against every idiot idea Michael Gove is subjecting state education to: free schools, reform of GCSEs and performance related pay; and changes to teachers’ terms and conditions that would be like turning the clock back to the 1950s. Every advance that has been won by previous generations of teachers, he is seeking to overturn: agreed working hours, a limit on admin tasks, planned time for preparation and assessment, only rarely covering for absences and – get this - the right to a lunch break. When it was recently revealed that Gove has been having sweet nothings whispered in his ear by Dominic Cummings - one of those creepy, swivel-eyed, ideological policy wonks - some of this started to make sense. I don’t know what it is with the relationship between Tory ministers and their special advisers. The timing of the strike turned out to be quite fortuitous as there were several blows to Gove’s free school policy last week: the Al-Madinah free school in Derby was given a dysfunctional rating in all categories, with the severest criticism reserved for the standard of unqualified teachers. That this should be a shock to Ofsted – untrained teachers not knowing how to teach – is baffling. Under Gove’s revolution, the only person in a free school who is required to be qualified is the SENCO (Special Educational Needs Co-ordinator). Not even the Head needs to be a proper teacher and, as a result, there were two resignations of unqualified headteachers at free schools in London and West Sussex last week – both realised before the first term of the school year had ended that they were not up to the job. If we were looking to Labour to offer a future to state education, we were quickly disappointed. The hope that many in education felt, when Ed Milliband shuffled the education shadow Stephen Twigg out the door, quickly dissolved as soon as his replacement, Tristram Hunt, started spouting muddled Tory-lite policy ideas. After the conference season, Milliband had firmly put Labour on the side of ordinary people, and the Tories on the side of business. All that has been undone in his reshuffle, with Hunt unable to articulate coherent opposition to Gove’s dismantling of inclusive education and Rachel Reeves, the new work and pensions shadow, scandalously trying to out-muscle the Tories with her threat to bully benefit claimants. 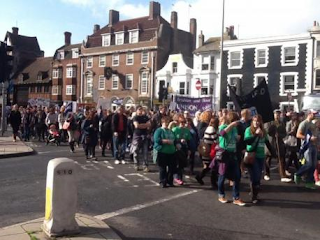 On the strike day itself, there were teachers’ rallies in Hastings, Eastbourne and Brighton. There was a tremendous level of support, with over 2,000 out on the streets again in Brighton, marching from Pavilion Gardens to the Brighton Centre to hear speakers from the NUT, the Fire Brigade Union - also having their service attacked - and Green MP Caroline Lucas. There is talk of a one-day national strike in education and other public services, next month. This will be difficult for teachers, who disrupt the school day reluctantly and for who the loss of another day’s pay will be a struggle in these tough times; but if we don’t stand up for ourselves, we will be like turkeys voting for Christmas.